In this update from the president, Victor Kubik gives a brief update on the Feast of Tabernacles. He also goes into some detail about his trip to Sri Lanka and India. Beyond Today seminar attendees in Vijayawada, India. From reports that I’ve received so far, the 2018 Feast of Tabernacles was indeed a joyous event observed by the Church with rejoicing and the definite purpose of learning to fear our God. You, no doubt, have a great story to tell about your Feast where you have kept it. Beverly and I were in Panama City Beach, Florida, which was hit just days ago by Hurricane Michael. It made landfall at Mexico Beach which is just east of Panama City Beach. Pastor Scott Hoefker has contacted the members in the area and has provided a report below. We were so thankful that the weather during the Feast of Tabernacles was beautiful. You can see a report about the storm’s effect on Panama City Beach in this news clip at https://www.nbcnews.com/news/weather/panama-city-weathers-brunt-hurricane-michael-s-destructive-force-n918756 . I’d like to make a note about the effect that our brethren at the Feast had on the Panama City Beach community. Many of our people are shuttled by trams from their lodging to the auditorium. One of the tram drivers was told that I was the president of the United Church of God. He drove up to me and said he wanted to say something about our people. He’s been working with various groups for the past five years who come for meetings in Panama City Beach. He said that he’s never seen a group of people that have shown the kind of courtesy and kindness that the people of the United Church of God do. The behavior of our people was extraordinary not only among ourselves but towards others, as well. He wanted us to know that. This unsolicited endorsement of our brethren’s conveyance of light was most heartwarming. Feastgoers who meet around the world, do attract attention because of the way we conduct ourselves and treat one another. I invited our driver to services a few times in seeing him shuttling people, but he said that he was on duty at those times. Beverly and I are traveling in the countries of Sri Lanka and India where we have congregations and scattered brethren. We are with Senior Pastor David Schreiber and his wife, Jolinda. He has been asking me for three years to make a journey to this part of the world. We not only met for church services, but we also conducted four Beyond Today seminars. One was in Sri Lanka and three in India. The Colombo, Sri Lanka, congregation is quite vibrant and warmly expressive. On Friday night, Oct. 5, we had a get together with 30 at one of the brethren’s homes. On the Sabbath, we had services followed by Beyond Today presentations by David Schreiber and myself. From there we flew to India, first to Vijayawada and then to Visakhapatnam. Then drove to the village of Anakapalle outside of Visakhapatnam. We held Beyond Today seminars in all three places with attendances of 55, 54 and 55, respectively. In Anakapalle we held a question and answer session after the seminar. A good number of the attendees were pastors of Sabbath and Sunday-keeping churches. Our BT conference was actually billed as a Pastors and Leaders Conference because of the number of other pastors who came to the event. In the question and answer session the main question addressed was about the seventh day Sabbath. Several there were introduced to this topic recently and were beginning to rethink the biblical Sabbath day. They were very interested to hear of the scriptural support for the seventh day Sabbath presented by David Schreiber and me. In Visakhapatnam, we visited former ABC student Ezekiel Polinati. I did a podcast with him in which he described his life’s story and conversion. The Beyond Today seminar was held on Ezekiel’s property, at a church hall where his father preached. I have been writing about this trip in detail with many photos at http://v2.travelark.org/travel-blog/victorkubik/24 . 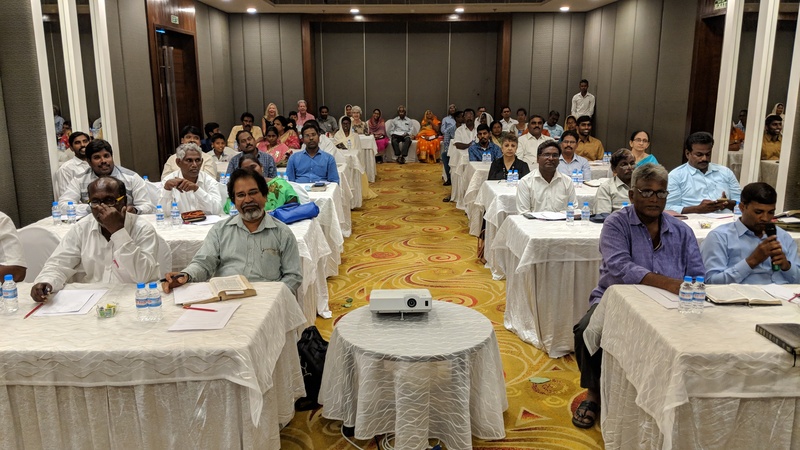 I want to take this opportunity to express how much we appreciate the work that David and Jolinda Schreiber have done in service to God in Sri Lanka and India. For eight years they have faithfully cared for these people. It is interesting to watch them work together and see how they implement the varied duties ranging from caring for the congregations, writing a comprehensive weekly newsletter, organizing the Feast of Tabernacles, conducting Beyond Today seminars and much more! They have traveled to this area 14 times. As we’re traveling together, I liken their work to what the Apostle Paul did in caring for the churches and preaching to the public in an environment that is not easy. There are so many things that could go wrong with arrangements and health. Another person I want to recognize is elder Ken Murray and his wife, Ruth, who live in Australia. He has made numerous visits and has established and shored up brethren in both Sri Lanka and India. He has traveled completely at his own expense and has expended a tremendous amount of energy in serving these people. In this huge area of millions of people, mustard seeds have been planted and are growing. But, it takes planting and watering. It was awesome to see this vitality and to see the growth. Beverly and I have stood in awe of what we are witnessing. At the time of this writing we are in Calcutta (now known as Kolkata), on our way to the state of Mizoram where we’ll be meeting with the final group on this trip. We have been delayed on our flight because of Cyclone Titli that is headed right for Calcutta at the time of this writing. The group in Mizoram calls themselves the United Church of God — Mizoram. One of their elders, P.C. Lalvuana, made contact with us back in 1997 when he found our beliefs were remarkably similar to their own. Within the last few years they have adopted our fundamental beliefs. They have wanted a closer relationship with us and have always treated our visitors with the greatest respect. They requested permission to publish and distribute our literature in their own language of Mizo, at their own expense. This permission was granted by the Council of Elders in August 2017. They are self-sufficient and have not asked for any financial help from us over the years. We’ll be there for the coming Sabbath of Oct. 13 and perhaps another meeting on the day or two following. We will return to the United States on Wednesday, Oct. 17. On this visit, the four of us are grateful for what God is doing the lives of these people. We are thankful a mustard seed of the Kingdom of God has been planted that will grow into a tree. We are thankful that the coming Kingdom of God will bring joy to this earth. Coming here just after the Feast of Tabernacles has reinforced that vision for us. Hurricane Michael made landfall near Mexico Beach on the Florida Panhandle as a Category 4 storm early Wednesday afternoon. Maximum sustained winds of 145 mph have been recorded in the storm’s eye wall. It is the first Category 4 storm in recorded history to make landfall in the northeast Gulf Coast. It is still too early to tell what the final outcome of the hurricane will be with our brethren and property damage. It seems that all members are safe, but I can’t reach some yet by landline or cell. So I don’t know for sure. We must remember that so many people are suffering, in addition to our members. Interstate 10 is partially closed, and I’ve cancelled Sabbath services in DeFuniak Springs for this Sabbath, since it may not be possible for many to get to services. One member called me last evening to convey “their property was okay, but have no power, and trees are down all over the roadways, so they can go nowhere”. Several members are without power, and will be for some time, and will likely lose all of the items in freezers and refrigerators… Your continued prayers are appreciated.